Ingredients: Organic wholegrain brown rice, organic apple juice concentrate, organic cinnamon. May contain: Milk, soy, sesame. My baby lovessss them and wonâ€™t share it with me. Itâ€™s super yummy and fresh! Kids liked them and I appreciated the "healthier" flavour option compared to the main stream brands. My son loved these. Happy that they include a little spice to develop his palette. This is a great little on-the-go snack! And a good distraction for my baby to munch on when we are out and about! 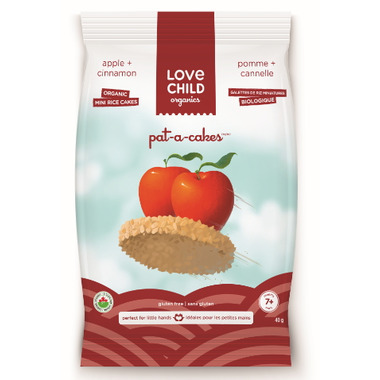 Our 8 month old likes these, but they are just small sized rice cakes with no added sugar. They dissolve well, so I'm not worried about choking and they are easy for small hands to hold. The bag dint resealable so you need to transfer fr storage or they go stale quickly. By far, my daughter's favourite snack. She will eat these all day long if she could. My son absolutely loves these. All they are are mini rice cakes with powdered fruit and veg on them (depending on what flavor you get). 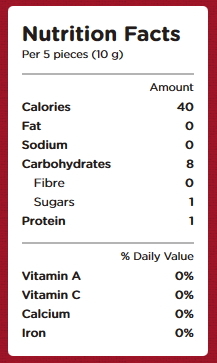 There are a whole whopping 3-4 ingredients and no sugar/salt/synthetic flavourings added at all. We've been giving these to our son since he was 9 months old as either an on-the-go snack, or with hummus, cream cheese or peanut button on them during meals. They're awesome because they're so simple and easy for him to grasp. Very tasty, but a small bag. Worth it to offer a new taste or treat for 9 month old self feeding. My 10 month old daughter loves these. I try to give her other "cookies" but she always knows the difference. Both my 9 month old and my 2.5 year old toddler love these. I would give them a 5 but the small size of bag is a little disappointing. These are wholesome and yummy for a baby treat, though I was a bit disappointed at the size of the bag. My little one loves this and has been eating them for months, has not gotten bored of them yet. Happy to know they are healthy. A great snack for young and old. Nice simple cracker. I gave them 4 stars because I feel you should get more in the bag. My 9 month old likes these snacks, however a little too pricey for a rice snack and such a small bag! These are great healthy and organic rice cake snacks for toddlers. My son loves having his own 'chips' to snack on! With such minimal ingredients, I love feeding these to him. The only downside, is I feel the bag is a little bit small.